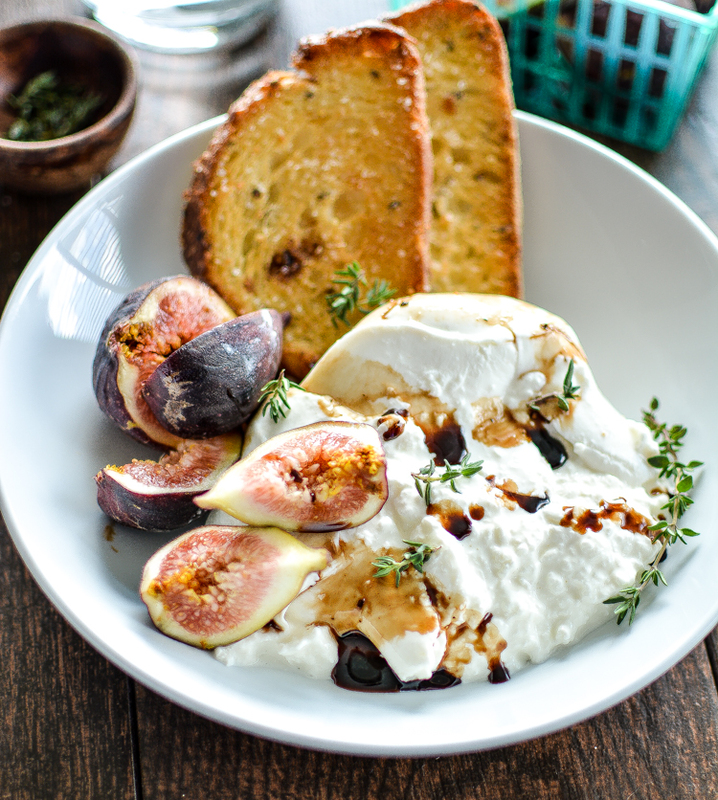 Burrata with Fresh Figs and Crispy Bread: a midday snack or appetizer recipe to get excited about! Fresh and creamy burrata is topped with a handful of fresh figs and drizzled with balsamic vinegar that has been reduced to syrupy goodness. Pair with a couple of slices of crispy, toasted bread, and this burrata with fresh figs is elegant yet simple and delicious! Recipe for this burrata with fresh figs and crispy bread is below, but it’s so easy you almost don’t even need a recipe! Pair it with a porter and have a wonderful weekend everyone! In a small saucepan, add the balsamic vinegar. Heat over low, stirring occasionally, until thick and reduced by at at least 2/3. The vinegar should easily coat the back of a spoon. Remove from heat and set aside. Preheat the oven to 375 degrees F. Line a large baking sheet with foil or parchment paper. Brush the bread with olive oil on both sides and season with salt and black pepper. Place the bread in the oven to toast, about 8-10 minutes (flip after 5 minutes). Divide the burrata between two bowls. Distribute the figs evenly and drizzle with reduced balsamic vinegar. Serve with crispy bread and enjoy immediately! 0 Response to "Burrata with Fresh Figs and Crispy Bread"